Security guard patrol app technology is a necessity for any security officer business that wishes to thrive in today’s world. Situational awareness is simple with a real-time tracking/ GPS guard patrol app. And simple doesn’t mean that it can’t get you every bit of data you need for your customer. 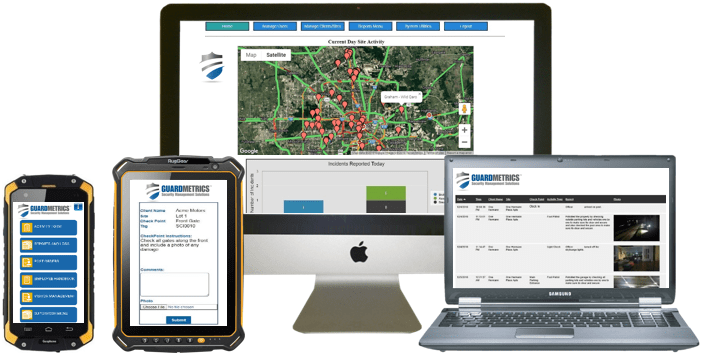 The GuardMetrics security guard patrol app is easy to use, easy to manage, and easy to pay for, in that it is part of one of the most cost-effective mobile officer management systems made in America. We have developed this security guard patrol app to work on Android, iPhone, Windows-phone; any mobile smart-device you like; including the officer’s personal phones. And the system uses very little data, so it won’t cost you in service, or in battery life! Call us to discuss a security guard patrol app that will get you what you need as efficiently as possible! Ease of use and affordability are part of the equation for a successful security guard business, but a security guard patrol app needs to be dependable and deliver real-time results. With GuardMetrics you will know where and when every activity takes place. Every event is time-stamped and geotagged with a satellite photo. From scanning a QR code, NFC or RFID tag at a checkpoint, to submitting a mobile incident report or daily activity report, this guard patrol tracking app will provide you with true situational awareness, that you, in turn, can provide to your clients. The GuardMetrics patrol app even allows you to offer a branded “Client Portal” to your customers if you wish, providing them with a personal database through which they can sort and view their stored reports any time they wish, from any computer, pics, videos and all; often saving on your need to even send reports. Call or click here to discuss a security guard patrol tracking app that will provide your customers with real-time security. When we say “branded”, we mean that there is no reason that your client ever needs to know we’re involved. The GuardMetrics patrol app and guard patrol system allows your security guard company to send your clients reports with your company name and your logo. We even give you the ability to add special options like the “Client Portal” or the “Community Security Portal” directly into your own website! The Community Security Portal is a feature that other security guard patrol applications simply don’t have (none that we’re aware of, at any rate), which means that your competitors can’t offer it! It allows you to offer an additional layer of security to your services that will help you win security guard bids. When you add the simple dynamics of this security guard patrol app with the easily customizable features, the branding to your company, the assistance in marketing and sales, the first rate customer support, and the excellent features that other guard patrol apps don’t offer, you have everything you need to streamline your security officer management operations. Call us now to see why the GuardMetrics guard patrol app is the right choice for your security officer business!